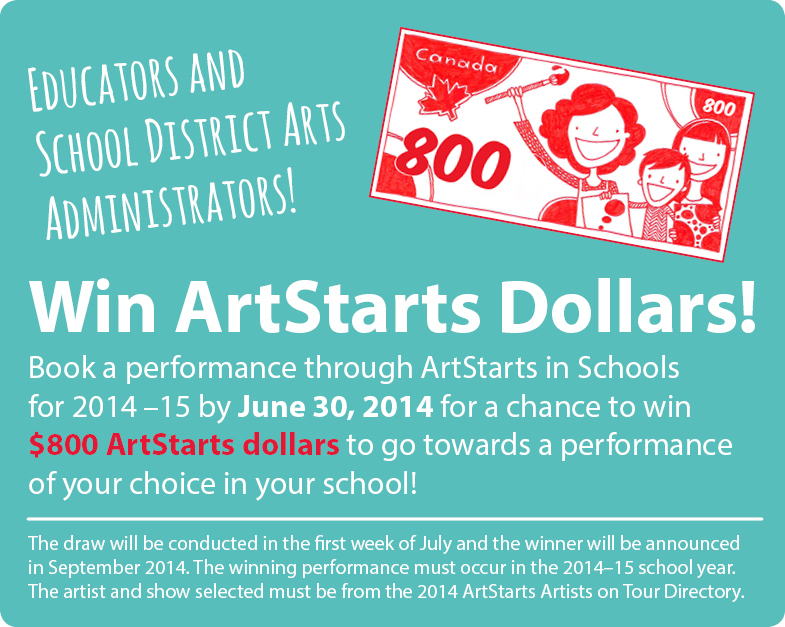 If you're planing to book performances in your school for the upcoming 2014–15 school year, be sure to get your booking requests in to ArtStarts by June 30, 2014, for a chance to win ArtStarts Dollars! The winner of this draw will receive $800 in ArtStarts Dollars, which can be used towards a performance of your choice (details below). Each booking you make counts as one entry in the draw. Last year's draw winner was Salmon Arm West Elementary in Salmon Arm, BC. Will it be your school this year? Browse the Artists on Tour Directory to discover a diverse range of talented artists with performances created for young audiences. Learn more about Booking + Touring or download a Booking Request Form.